The concept of investing in underwater hotels seems to have sunk without trace without a single project so far getting past the planning stage. The proposals for several projects were met with a wave of optimism that was soon dampened when investors realised the massive costs associated with the projects. Several projects have failed to move off the drawing board. The latest include the Water Discus in the Gulf and Hydropolis Hotel, Dubai, and the Poseidon Resort, Fiji. Costing for the Poseidon show why investors are not keen to back underwater hotels. The resort would have just 22 exclusive and luxurious guest rooms, a restaurant, bar, library, wedding chapel and spa all underwater. Developers reckon construction costs of around $250 million – working out at $11.4 million per room compared with around $1 million a room for a luxury hotel on land. Guests would be expected to pay around $5,000 a room per night. The numbers don’t work for investors, which is why the project has been held on the back burner for some years. The Hydropolis is planned to sit 20 metres below the surface off Dubai. With 220 rooms, the hotel is considerably larger than The Poseidon, but investors question why development costs per room are triple the cost of similar rooms in leading Dubai hotels. Cost are thought to be around $550 million for the resort and hotel – averaging $2.5 million per room sold at the same rate as The Poseidon. The Water Discus is a different proposition – with half the 44-bedroom resort above water and the rest below the sea. Several projects are planned and some funding is already in the bank. Destinations include Dubai and The Maldives. The developers expect room rates in the first hotel – The Maldives – to reflect the build cost and make the proposition more interesting for investors. To ease the funding, the Polish based developers have raised $21 million from the European Union. “To move forward on these projects that demand cutting edge technology, we have relationships with scientists and engineers from Polish shipyards, universities and research and development institutions,” said a spokesman for the firm, Deep Water Technology. The completed hotel will offer diving and water sports to guests, alongside a luxury hotel experience, including three-seater underwater submersibles for exploring the sea floor around The Maldives. 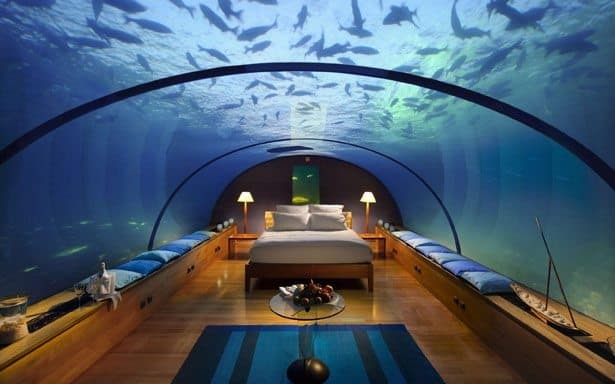 Underwater airlocks will let divers straight out of the hotel into the Indian Ocean.